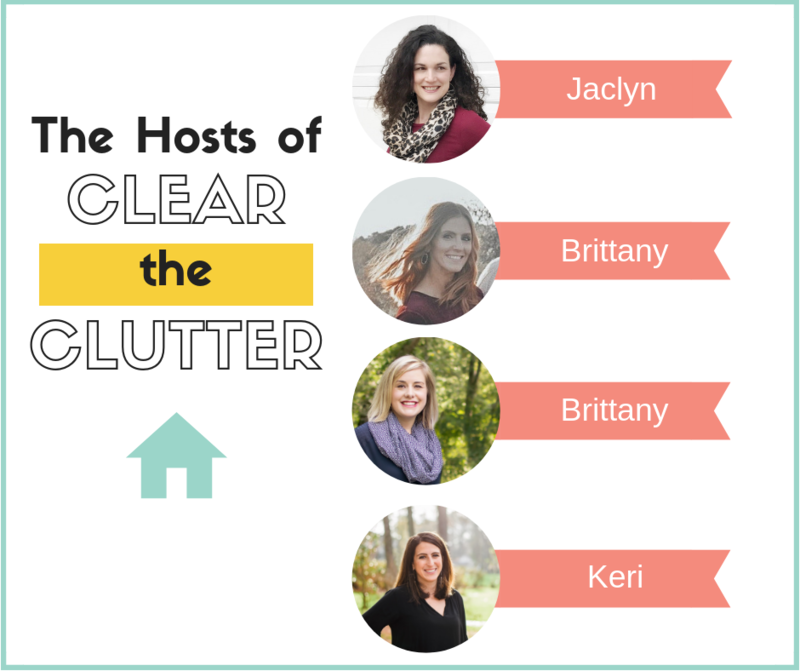 Today starts the last week of ‘Clear the Clutter,’ a 5 Week Organization Challenge! Over the past 4 weeks I joined three other amazing bloggers as we organized our homes together! Last week we organized Aubrey’s small bedroom closet. Whoa, what a change from such a small, non-functional space, to an organizing system that really works for her! This week, the Clutter Challenge is tackling our storage spaces. 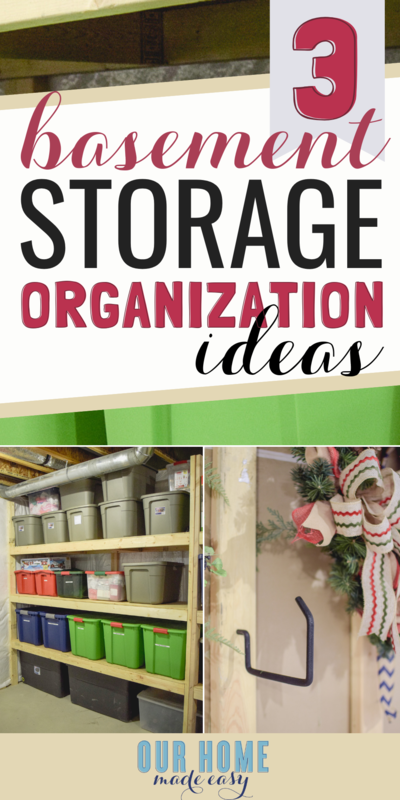 I had big plans to show you how we decluttered our garage and then organized it. But then— mother nature had other plans #PolarVortex and we were left with windchills that felt like negative 45 degrees for a few days. Unfortunately, that meant no one was leaving our warm spaces to venture outside unless they needed to do so. One of the best things about plastic storage totes is that they come in all sizes. You can buy them in any color, with just about any type of lid. One of the worst parts about totes? They come in all sizes. 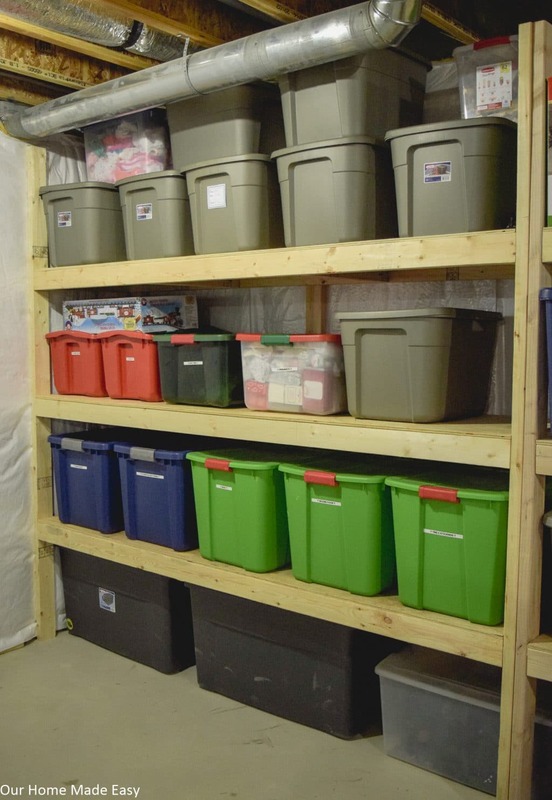 If you are just starting organizing your basement or storage spaces, take a few extra minutes before you run to the store and consider what size totes you want for the long-term. Once you have a size/idea in mind, it makes organizing them in a tidy way so much easier! I promise, I was on team #whateverIsOnSale and it was exhausting trying to organize totes that didn’t sit next to each other well, took up too much space, too little space, and those that had handles that never worked. We still aren’t perfect about the tote colors. For us, we’ve been focused on buying consistent sizes, that I let the holiday colors sneak into the mix. And I know right away which totes should have Christmas items in them! Don’t forget to write on the outside of each tote what is inside. It will save you so much time later when you need to find something quickly. The overwhelming sea of ‘stuff’ is hard to stop when you don’t have a shelving system. After living in our home for a couple of years, our basement was a never-ending flow of totes and other random things. Thankfully, Jordan had the idea of building a super cheap storage shelving solution to help with this. 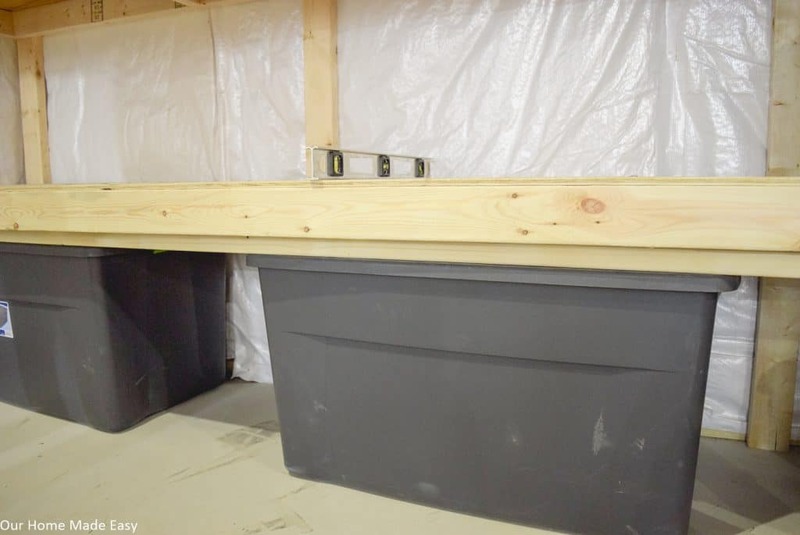 By following Jordan’s plans and building your own shelving, you can make sure your totes fit just right on the shelves and avoid extra space waste. First, group like-sized items. 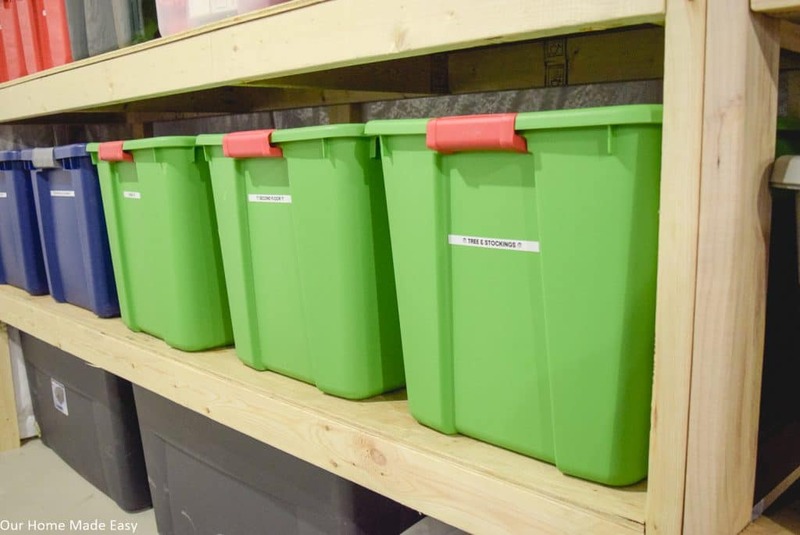 While it may not be close together in the seasons (all Christmas mixed amongst Spring, Fall decor & clothing), it’s way simpler to build a system for gathering those same sized totes. 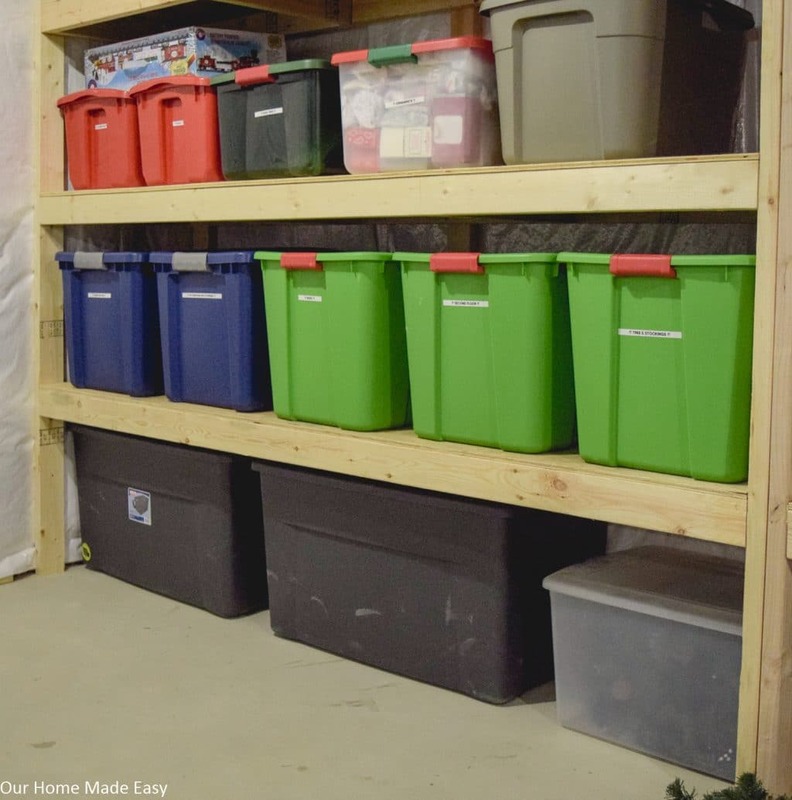 Measure the tallest items and add 6″ to give you plenty of room for moving your totes in and out. Continue grouping the totes together and measuring. Next, do this for the items that aren’t necessarily in totes, but in boxes. Finally, end with grouping items that are not boxed and are loose. Now that you know how much you really have in the basement, that will give you a better idea of what you’ll need to build or buy in a store. Don’t forget to give yourself some expansion room for new totes. As our kids grow up, their outgrown clothes end up in totes in the basement. It’s so easy to fill up floor space! However, sometimes, it makes sense to go vertical and use the walls. For this, you can buy several different kinds of heavy duty hangers to move all the clutter that would normally be on the floor, in a pile, in some sort of organized style. I love hanging my wreaths on the wall. If I didn’t hang them, I feel confident that they would be tossed in a pile somewhere. Now, I can save time and swap out wreaths in less than a minute. To avoid crushing them, we hang them in the basement using bike holders! Not only can I quickly see what I have for the season, they are easy to hang up and take down. 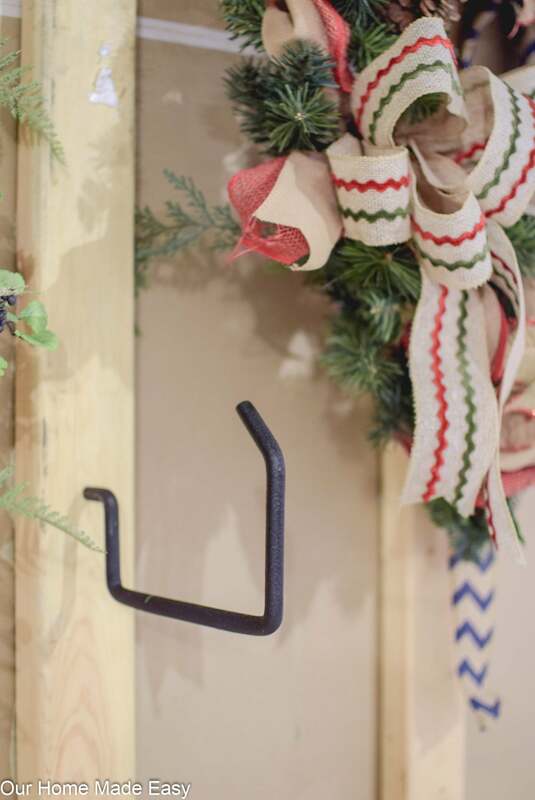 For our current wreath storage, I use both bike holders and utility hooks. You can find both at Lowe’s & Home Depot. And it’s not just wreaths. 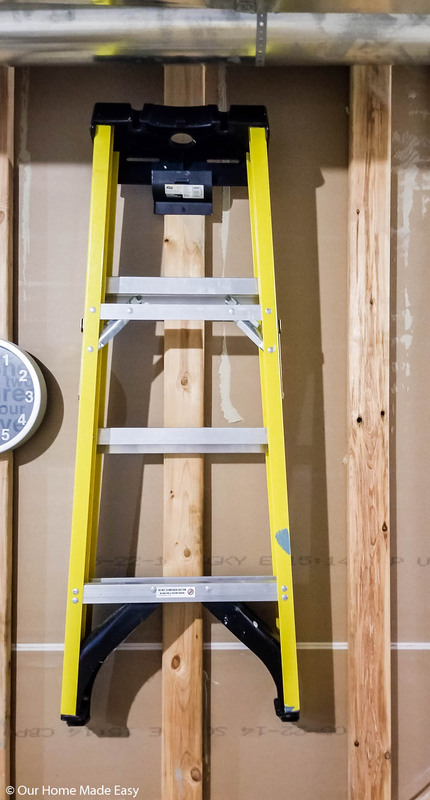 We hang our small step ladders, platforms, and extension cords on the walls. They all hang with heavy duty hangers that we picked up at Lowe’s or Home Depot. 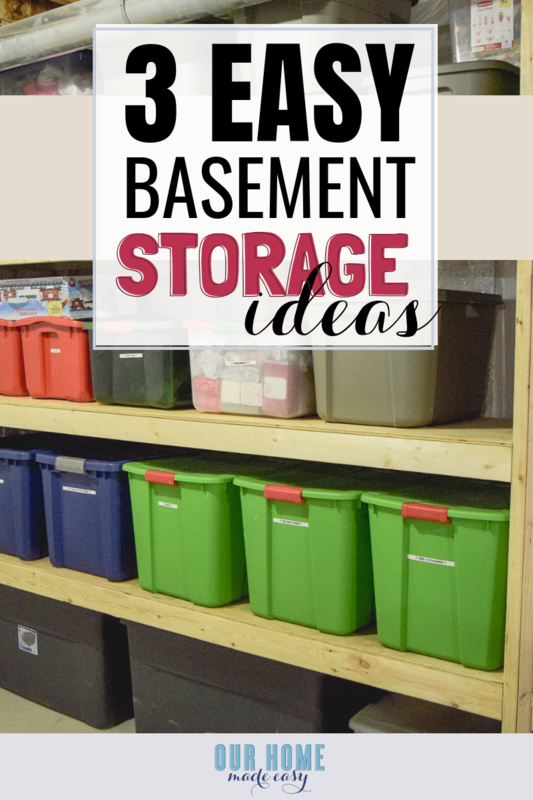 Whew, that was a lot about getting organized in your basement! Start by sorting the totes you already have, commit to buying consistently sized totes in the future, and start building up! And that is the last week of the challenge! I am so happy to have completed the Clear the Clutter challenge with you! 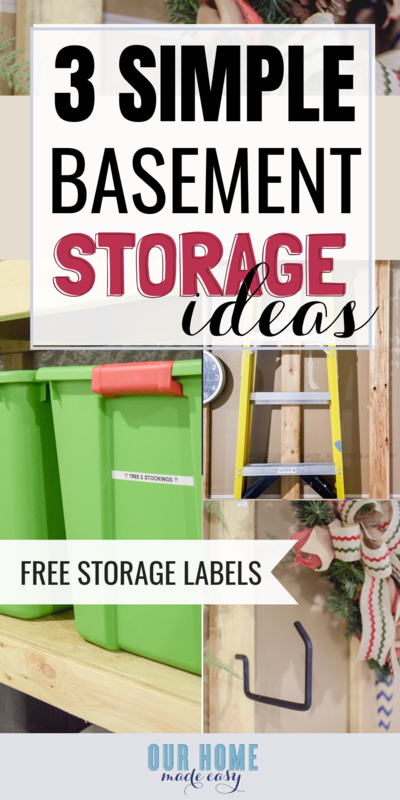 Are you ready to declutter and organize your storage spaces? Let me know in the comments below! And don’t forget to grab your copy of the Clear the Clutter Organization Calendar! It will walk you through each room of your home over one month. Even if we officially finish the challenge, you can follow along anytime.